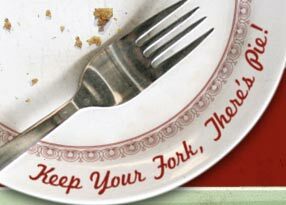 "KEEP YOUR FORK, THERE'S PIE!" "We must have a pie. Stress cannot exist in the presence of a pie." "He was as normal as pumpkin pie and now look at him." "A boy doesn't have to go to war to be a hero; he can say he doesn't like pie when he sees there isn't enough to go around." "It is utterly insufficient (to eat pie only twice a week), as anyone who knows the secret of our strength as a nation and the foundation of our industrial supremacy must admit. Pie is the American synonym of prosperity, and its varying contents the calendar of the changing seasons. Pie is the food of the heroic. No pie-eating people can ever be permanently vanquished." In response to an Englishman’s suggestion that Americans should reduce their daily pie eating to two days per week. Cleaves the earth with such happiness"
"There is no pie in Nighthawks, which is why it's such a desolate image." "Thy breath is like the steame of apple-pyes." Written in praise of a lovely lady. "The sugar suggesting jelly, yet not jellied, the morsels of apple neither dissolved nor yet in original substance, but hanging as it were in a trance between the spirit and the flesh of applehood… then, O blessed man, favored by all the divinities! Eat, give thanks and go forth, 'in apple-pie order !'" "In order to make an apple pie from scratch, you must first invent the universe." "Pie and Coffee is approximately the third best social interaction a man can hope to have with a woman."